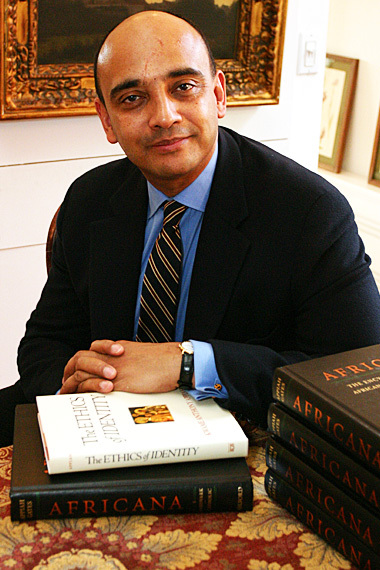 Award-winning philosopher and foreign policy writer Kwame Anthony Appiah examines questions of honor and societal obligation Tuesday, Feb. 17 in a Lawrence University convocation. Scholar Kwame Anthony Appiah examines questions of honor and societal obligation in a Feb. 17 Lawrence University convocation. A professor of philosophy and law at New York University, Appiah presents “A Decent Respect: Honor and Citizenship at Home and Abroad” at 11:10 a.m. in the Lawrence Memorial Chapel. He also will also conduct a question-and-answer session in the Warch Campus Center cinema at 2:30 p.m. Both events are free and open to the public. Named one of the “Top 100 Global Thinkers” in 2010 by Foreign Policy magazine, the London-born Appiah challenges audiences to consider the big questions: what does it mean to be a citizen of the world? ; what is a person’s obligations to others? ; should larger obligations always trump concerns for family, friends and local communities? Cambridge University educated — he earned both his bachelor’s degree and Ph.D. there — Appiah has written extensively on a wide range of topics, from foundations of probabilistic semantics to African and African-American literary and cultural studies. His 2010 book, “The Honor Code: How Moral Revolutions Happen,” focuses on how human morality is continuously shaped and altered around definitions and traditions of honor. Appiah has been recognized with dozens of honors and awards, among them the 2011 National Humanities Medal “for seeking eternal truths in the contemporary world,” election to the American Academy of Arts and Sciences and the American Philosophical Society and induction into the American Academy of Arts and Letters.